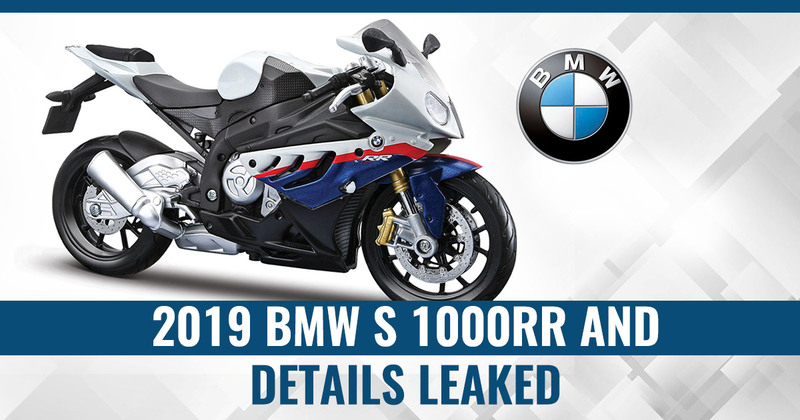 The BMW S 1000RR which has got updated with 2019 calendar year updates leaked online via a social media platform. 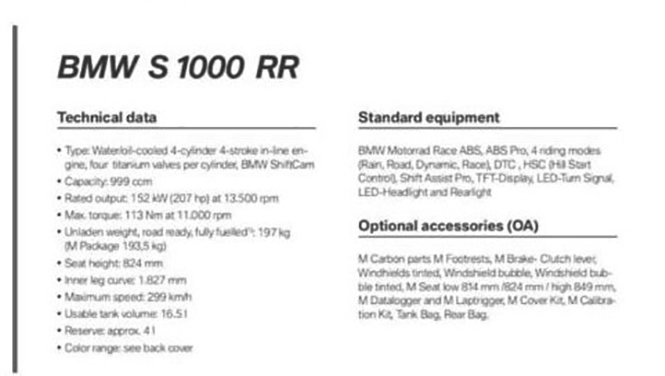 In the leaked images, there was details of the new BMW S 1000RR like engine specs, electronic features and optional accessories. Ahead of its unveiling, the motorcycle has been snapped several times performing test runs. The market-ready variant is radically different from the prototype model. It now packs evolved frame and swingarm. Well the fairing, the tail section is revised components on the 2019 S 1000RR wears a symmetrical headlamp design. More compact rather than last-gen model, the 2019 S 1000RR gets the rider aids of BMW Race ABS, ABS Pro, four riding modes (rain, road, dynamic, race), DTC (dynamic traction control), HSC (hill start control), Shift Assist Pro, TFT instrument cluster among the gizmos. Additionally, the headlamp, tail lamp and turn indicators are LED units. Behind the fuel tank, the 2019 BMW S 1000RR packs a 999cc, four-cylinder, liquid-cooled engine as a beating heart. Mated to a 6-speed gearbox, the refined engine now pumps out improved 204bhp and 113Nm against the 193bhp and 112Nm on the last generation model at 13,500rpm and 11,000rpm respectively. The leaked list of optional accessories includes M-series footrests, brake and clutch levers, tinted and bubbled windscreen and more. Here in India, the 2019 BMW S 1000RR is likely to reach around next year. While the motorcycle expects a price tag higher than the outgoing model available on sale at the asking price of INR 18.05 lakhs (ex-showroom, Delhi).